Modern Machine Shop 111 SHOPFLOOR CONNECTIVIT Y 2010s 2000s 1990s 1980s 1970s 1960s 1950s 1940s 1930s natural evolution of direct numeric control, which connects machine tools to a centrally located computer that stores and distributes part programs. Distributed numerical control followed, a similar setup in which a network of computers coordinates the operation of multiple machines, feeding programs into CNC memories where they can operate independently. Both networked concepts eventually came to be known as "DNC," and it was only a matter of time before wires began to vanish from the equation. At least for Miller, that was the case. The company had been on its way to implementing wired DNC before the lightning strike, but that event made cutting cords to machines a priority. So instead of hardwiring, the machine tools at the Brookville facility were equipped with wireless DNC devices to enable server access over Wi-Fi, by way of access points installed throughout the building. Installation and setup were successful, but integrating Wi-Fi did not come without worry and concern: Would it be reliable? Fast enough? Secure? Fortunately, even more than a decade ago, the answer to each of these questions was "yes." At the time of print, Miller reported no prob- lems with downloading numerical control (NC) programs wirelessly, and download speeds were adequate for its needs. 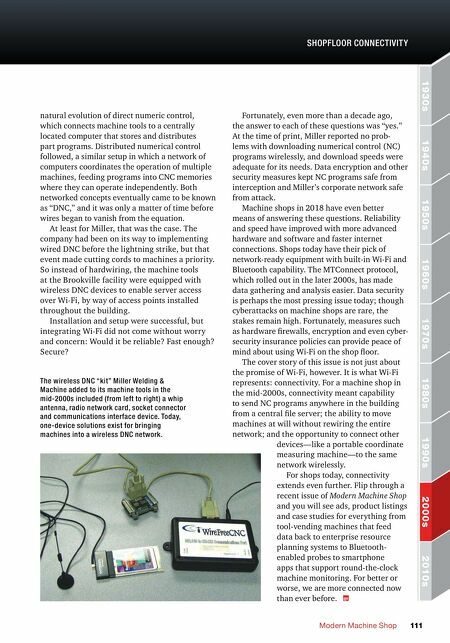 Data encryption and other security measures kept NC programs safe from interception and Miller's corporate network safe from attack. Machine shops in 2018 have even better means of answering these questions. Reliability and speed have improved with more advanced hardware and software and faster internet connections. Shops today have their pick of network-ready equipment with built-in Wi-Fi and Bluetooth capability. The MTConnect protocol, which rolled out in the later 2000s, has made data gathering and analysis easier. Data security is perhaps the most pressing issue today; though cyberattacks on machine shops are rare, the stakes remain high. Fortunately, measures such as hardware firewalls, encryption and even cyber- security insurance policies can provide peace of mind about using Wi-Fi on the shop floor. The cover story of this issue is not just about the promise of Wi-Fi, however. It is what Wi-Fi represents: connectivity. 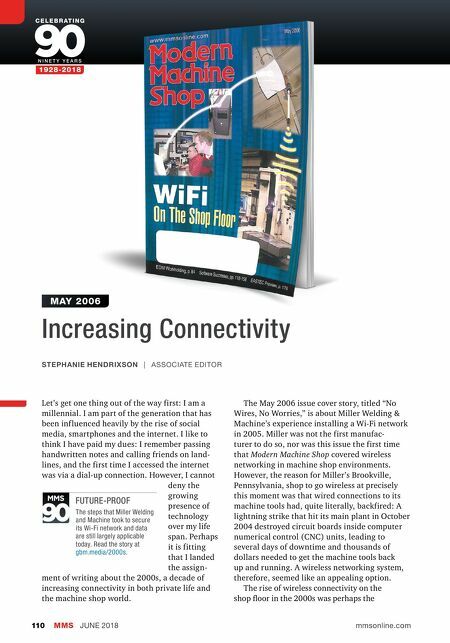 For a machine shop in the mid-2000s, connectivity meant capability to send NC programs anywhere in the building from a central file server; the ability to move machines at will without rewiring the entire network; and the opportunity to connect other devices—like a portable coordinate measuring machine—to the same network wirelessly. For shops today, connectivity extends even further. Flip through a recent issue of Modern Machine Shop and you will see ads, product listings and case studies for everything from tool-vending machines that feed data back to enterprise resource planning systems to Bluetooth- enabled probes to smartphone apps that support round-the-clock machine monitoring. For better or worse, we are more connected now than ever before. The wireless DNC "kit" Miller Welding & Machine added to its machine tools in the mid-2000s included (from left to right) a whip antenna, radio network card, socket connector and communications interface device. Today, one-device solutions exist for bringing machines into a wireless DNC network.